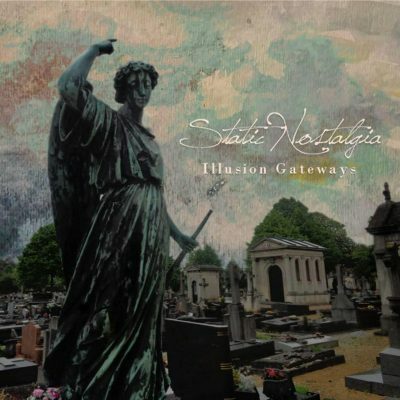 After spending the last year playing a run of shows in the Salt Lake area, Static Nostalgia have released their debut record, Illusion Gateways. The band’s music isn’t necessarily complex: succinct pop songs with catchy guitar riffs, even catchier hooks and eccentric vocals. The album delivers rock songs that often delve into danceable territory, but always with an underlying sense of sadness and dread. At the forefront of all these songs are the technically ambitious vocal melodies of singer Miranda Lewin. The delivery of these vocals are apt to change within a song from long, melismatic wanderings to short, snarky quips. These changes happen suddenly, and often so unpredictably that they sound manic. Sometimes, this can help add a layer of interest into what would’ve been an overly repetitive song, as in the song “Heart Eclipse.” Given the themes of heartbreak and loss found in many of the lyrics, the dramatic singing elevates the emotional quality of these words to something tangible. The best tracks on Illusion Gateways utilize the age-old formula of quiet verses and loud choruses to great avail. “Light” plods along a funky, echo-driven guitar riff while the haunting whispers of Lewin float over the mix, all until the chorus hits and the band rides a driving groove that recalls the best of dance-punk. “Dead City” sounds a bit out of place on the normally melancholy record, but it nonetheless succeeds at being a lovingly goofy and sardonic surf-rock song about teenage rebellion and disillusionment. On “Burns,” the sole track to feature Spencer Minton on vocals, the subtle guitar lines and near-croon singing break away from the band’s indie-punk sound and turns the track into a fantastic, ‘70s-style rock ballad. It’s a shame that Minton only heads this track, because “Burns” makes a case for him as both a promising lyricist and singer.